I’ve been on an extra crafty kick the last couple of weeks and wanted to share some of my accomplishments with you. TABLE RUNNERS – My mom had made herself a very cute valentine table runner and after seeing it I wanted to make one too. It looked easy enough but at the same time clean and professional. 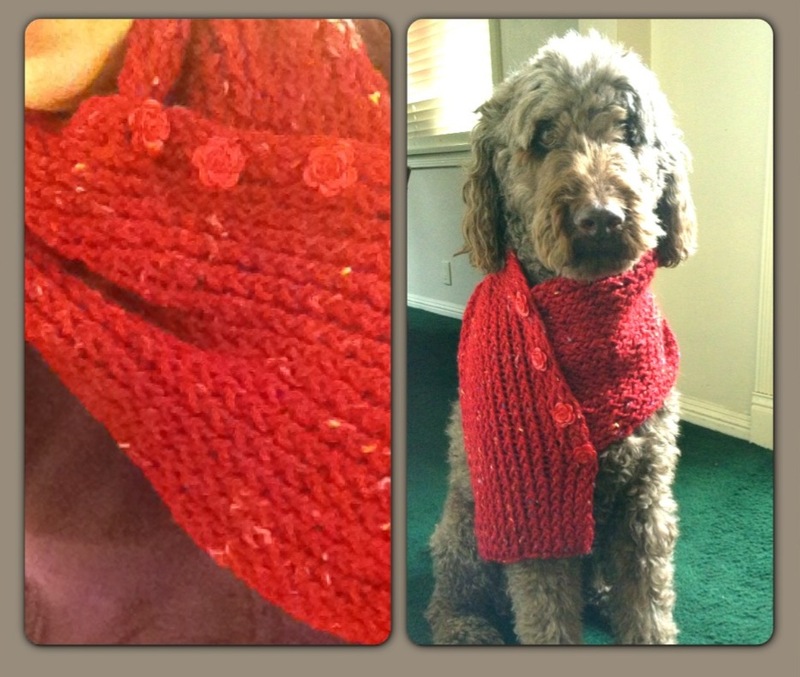 I decided I was going to make one for my friend Leslie as a hostess gift for an upcoming gathering. Off to JoAnns I went with Mom to see what we could find. After both agreeing that Leslie would like the material we picked out we were on our way. Back at my mom’s house she took her fancy quilting cutting mat, t-square, and fancy fabric wheel cutter and showed me how to make the pieces perfectly rectangle. Honestly I didn’t see the need for this step — a thought which would soon come back and bite me. At home I really did whip up the very pretty table runner in no time. The hardest part, as my mom had already warned me, was trying to make the two overlapping sides even. Still I managed to make the entire gift with very little cursing. The success of that project led me to believe I needed to make another one for the guest of honor at the same social gathering. Our friend Rachel was going to be visiting us from WI and if that wasn’t enough to earn her a handmade table runner it was also her birthday. After hiking with the two dogs (http://wp.me/p159Ee-ah) Sunday I cruised on over to the crappy JoAnns in my neighborhood. Sadly, although not surprisingly, that crappy location was closed and the dogs and I took off in search of another one. At the new-to-me JoAnns I came upon the most beautiful and colorful fabric ever! I picked it up and thought, “I guess I shouldn’t go that crazy with the colors for someone’s gift” so I put it back. Then I found coordinating fabric and it was on! I grabbed both spools (they aren’t spools — what are they called? ) of fabric and took off to get them cut. After leaving the store I immediately called my mom to tell her she wasn’t there to stop me from buying they most colorful fabric available! Remember when I said the first step was to square off your fabric? Well I didn’t have my mom’s fancy tools this time so I had to make do with what I had. I really tried to skip that step but the fabric wasn’t laying right together. So I did what I always do when I need some sort of t-square type measuring device. I went to my bookshelf with art books to locate something that could be an adequate substitute. I grabbed the works of Diego Rivera. Much like the man himself the book is larger than you would expect. I carefully folded the fabric and laid the book so that it was square to the top seam, drew a line down the side and cut. It didn’t take long before I realized it wasn’t straight and had to do it all again screaming, “Way to screw me Diego!” I have a feeling he heard that a number of times during his life. After extensive cursing at random sewing items and lots of exclamations of “good enough,” I did get the table runner together. It isn’t as perfect as my first one but my theory is if you are staring at a table runner long enough to notice it isn’t exactly even, you have bigger problems to worry about! If you want exact instructions there are a ton of how-tos on Pinterest for the 10 minute table runner (Total lie by the way. Takes longer than 10 minutes.). I’m not sure which came first but here is one you can reference if you’d like to make your own – http://tinyurl.com/b3pnavk. 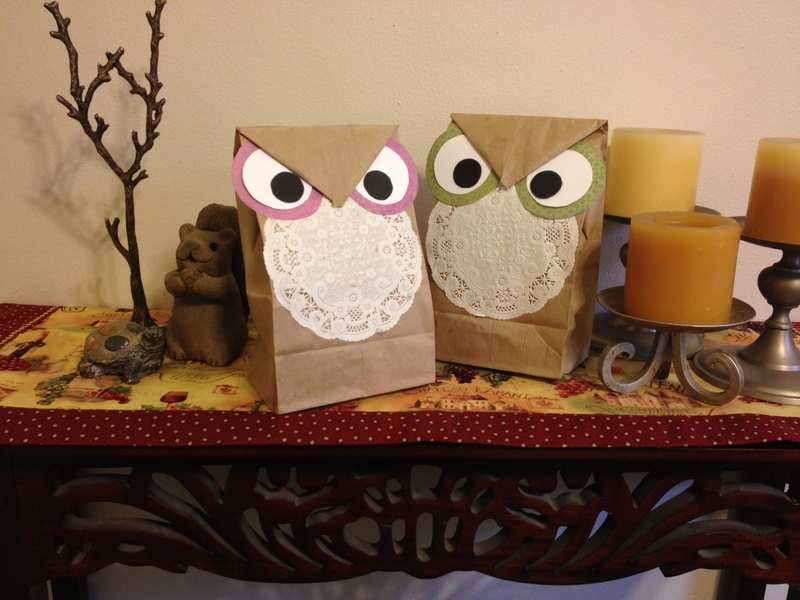 GIFT BAGS – This past week my mom send me a picture of some cute owl bags. When I went to visit her this weekend she happily exclaimed that she had purchased brown bags so we could make the owls. So we did! 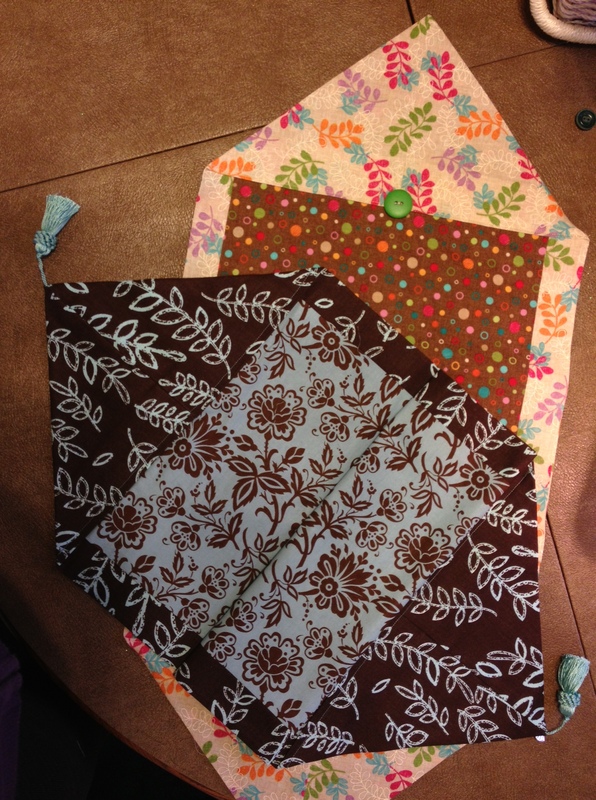 I folded up the table runners I had made and used these cutie bags as their gift wrapping. This original idea came from Pinterest but I can’t seem to find the original post. You will just have to pretend there is a link here. 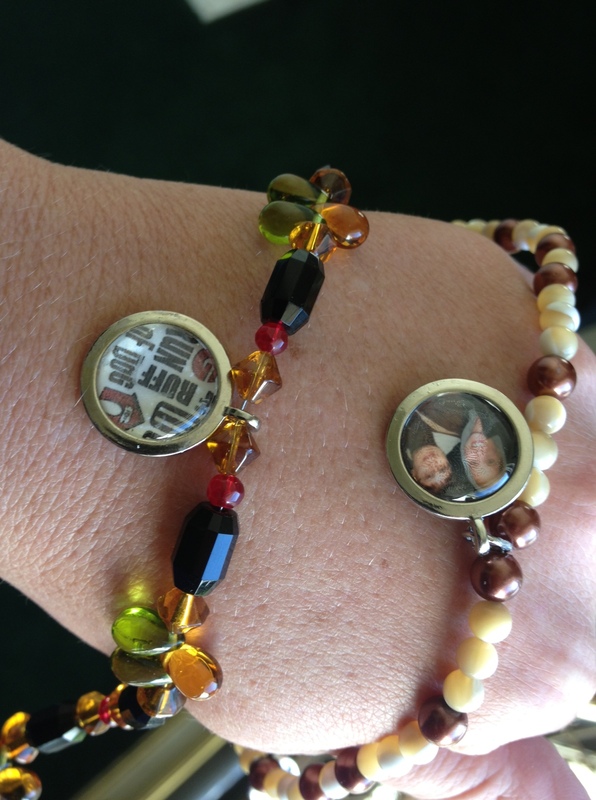 BRACELETS – Last year one of my Christmas presents was a cute little gizmo that let’s you make little round sticker like things to embellish scrapbooks, cards, etc. I finally had time to check it out and found that I had also received a package of blank charms you could put the round sticker on. I made my mom (http://wp.me/p159Ee-8G) and Giovanna (it was with her I OWE U so I wasn’t a total looser) both one. They are now back in my possession as they need to be remade shorter. Even though they don’t fit … yet, I made them so it counts for this blog! Whew. I’m in awe of my own craftiness. It isn’t over yet. I still have a St. Patrick’s Day table runner to make along with my very first quilt (gasp). I’ll let you know how it goes! i’m impressed – cooking, crafting (or craftily cooking), catching-squirrel-riggins-and-morgan-watching – u’ve attained nirvana! If only someone would pay me some cash for my self made nirvana!